An interview with Jill Breysse, CIH – part of a NEHA effort to highlight stories of dedicated professionals working to keep our communities healthy and safe. Breysse leads the Aging Gracefully in Place Project at the National Center for Healthy Housing (NCHH). The Aging Gracefully in Place Project evaluates the replicability of the Johns Hopkins University School of Nursing’s Community Aging in Place, Advancing Better Living for Elders CAPABLE model. The CAPABLE model is a unique approach to helping older adults successfully age in their own homes, reduce societal healthcare costs, and improve communities. NEHA interviewed Breysse to learn more about helping older adults live safely in their own homes. Breysse discusses the CAPABLE model, and her personal connection to this important work. Breysse: As a child, I remember wanting to clean up my little corner of the world. I asked for chemistry sets for Christmas so I could test and fix the creek in our backyard. In college, I majored in chemistry and landed a lab job testing manufacturing waste for hazardous chemicals. However, the lab felt too remote and far from where environmental problems originated. I decided to pursue a Master’s degree in environmental health science, specializing in the recognition, evaluation, and control of hazardous exposures. This progressed into a job conducting risk assessments at hazardous waste Superfund sites across the country. Finally, I came to work for the National Center for Healthy Housing, which has drawn me closer to directly helping people whose lives may be harmed by unseen hazards. My work at NCHH has been the most meaningful for me throughout my environmental health career because it brings direct positive change for both adults and children who, through no fault of their own, are often affected by hazards in their homes – the place where they should feel safest. NEHA: What are some of the unique environmental challenges associated with providing healthy housing for the older generation? Older adults are used to making their own way through life’s difficulties. Building trust is vital when trying to work with anyone, but especially with older adults. Working together, collaborating, and listening and as practitioners, remembering who is the boss of the home. These pieces go a long way to helping the older adults see and address home hazards. Once trust is there, even seemingly small changes can make a big difference. NEHA: Tell us about the CAPABLE model and why you think it is beneficial for the vulnerable older population. Breysse: Our Aging Gracefully in Place Project is funded by the Harry and Jeanette Weinberg Foundation, Archstone Foundation, and HUD’s Office of Policy Development and Research. We’re working with four diverse partners in communities around the country to evaluate the replicability of the Johns Hopkins School of Nursing’s CAPABLE program. The client works alongside an occupational therapist, registered nurse, and home repair professional to identify functional mobility goals he or she wants to achieve during a five-month period. The client also gains knowledge and experience that can be applied to other problems that may arise after the program ends. Through Aging Gracefully, we hope to show that these dedicated organizations can use CAPABLE services to help older people become more able to do daily life activities that have grown difficult with age, such as cooking meals, climbing upstairs and into bed, and taking a shower without assistance. Relatively small things – such as a second stair banister, an inclined pillow, restored porch steps, or a medicine calendar – can make a huge difference and increase physical independence and make homes safer. Hopkins has seen success in their Baltimore-based CAPABLE studies. Through Aging Gracefully, we’re also fostering a learning community among our partners (Community Housing Solutions of Guilford, Inc., in NC; Catholic Social Services of the Diocese of Scranton in PA; Cathedral Square Corporation in VT; and Family Health Centers of San Diego in CA), and collecting and documenting vital information needed to increase and sustain programs similar to CAPABLE across the country. NEHA: Please share a little about why working to help older adults has been important and meaningful to you. Breysse: My mom’s roots, in Howard County, Maryland, were extremely deep. Her adult home was less than two miles from her birth home, and a mile from the church where she was baptized, married, and where her husband, my father, was buried. All our lives, she told us over and over that her worst nightmare was to be forced to leave her home and be put in an assisted living facility. In her early seventies, my mom’s health deteriorated right before our eyes: dementia, diabetes, and high blood pressure were just a few of her ailments. Her increasingly poor health caused her to fall. These falls were scary and debilitating, and she became more and more reluctant to venture outside her home. She went through cycles of hospital stays and rehab stays, followed by returns to home. One day, she sadly agreed that she couldn’t live in her beloved home anymore. Even though her worst nightmare did come true, and she had to leave her home, in a sense my mom was lucky. She had sufficient funds to move into a comfortable place with supportive services, but it was never her “home.” People less fortunate than my mom often face bleaker housing prospects as they grow older. I am driven to ensure that people of all backgrounds and demographics can choose to live independently and safely in their own homes. I work hard to ensure that frailty, falls, and fear of nursing facilities don’t have to be a normal part of aging. NEHA: Have you worked one-on-one with older adults as well as on policy? Breysse: In my spare time, I volunteer for my church’s community food program, which supplies food to low-income homes with many older residents. My volunteer partner is a lovely 80-year old gentleman who can lift food boxes heavier than I can carry. He is great to work with and reminds me of my late father. As a project manager, I don’t get to work one-on-one with our project participants as much as I would like. Occasionally, I have the opportunity to accompany partners on home visits and talk with clients. I love it when clients occasionally call to thank me for helping them. However, the gratitude more rightly belongs to our funders who provide the resources for services, to Hopkins for developing the CAPABLE model, and most of all to our partners who are out there having conversations and establishing relationships with people who are gracious enough to participate in our studies. The money it would take for me to travel to project sites is often better spent on providing services to people in need. My job is to make sure our efforts lead to policies that provide these services for those in need. 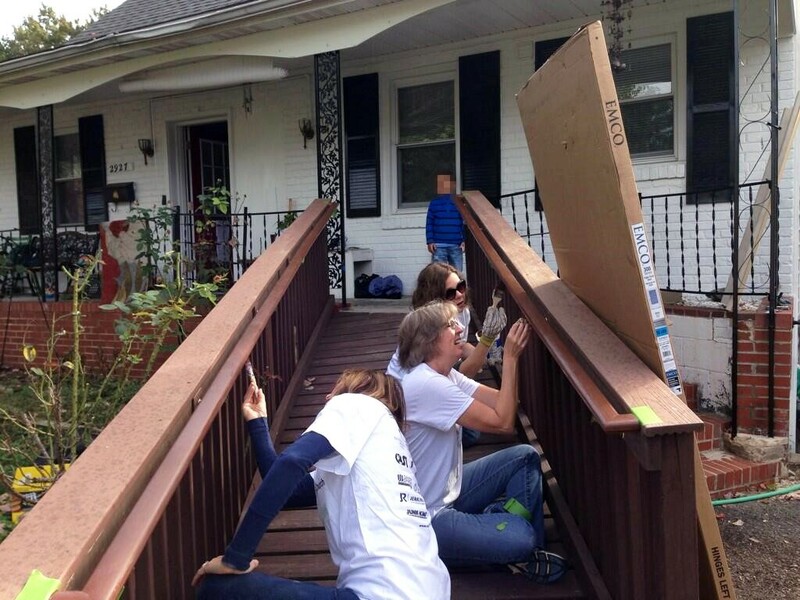 Pictured above: (Left) Jill Breysse and two colleagues, Laura Titus, Healthy Housing Solutions, and Amanda Reddy, NCHH Executive Director, on a volunteer day. NCHH worked with Rebuilding Together to fix up the home of a grandmother who takes care of her grandson. 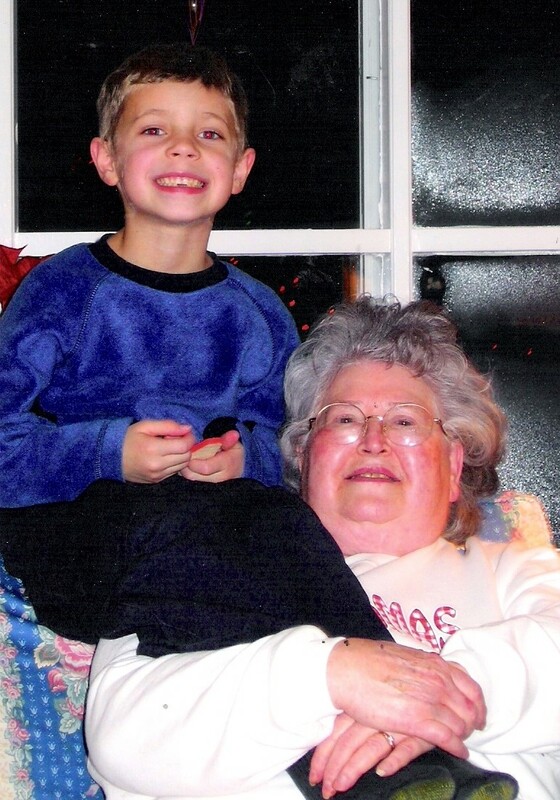 (Right) Jill’s mother with her grandson, on her favorite holiday, Christmas. Jill Breysse will be sharing more about her work at the 2018 Annual Educational Conference (AEC) & HUD Healthy Homes Conference, June 25-28, in Anaheim, CA. Community Built Environment Factors and Mobility Around Senior Wellness Centers: the Concept of “Safe Senior Zones” is an article for the Journal of Environmental Health on the subject of environmental health and older adults.